Monitoring of your Scale Out Network Attached Storage (SONAS) cluster resources is key to ensuring that all components are functioning at their optimum level. There are a variety of tools available to help collect valuable resource configuration, utilization, and performance information as well as capturing growth trends over time. This IBM® Redbooks® publication provides an introduction to several monitoring tools and how to use them. Scenarios for monitoring the SONAS environment using these tools are provided. The tools documented in this publication are SONAS built-in monitoring, IBM Tivoli® Storage Productivity Center, Arxview Data Center Analytics Engine, and the Galileo Suite Storage Monitoring product. 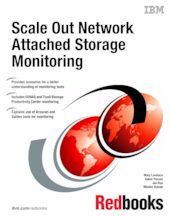 This book is written for anyone who needs to learn how to monitor their Scale Out Network Attached Storage (SONAS) resources. It is suitable for IT architects, business partners, IBM clients, storage solution integrators, and IBM sales representatives.